Primary Use: Cordless Telephone, Walkman, Discman, Digital Camera. All devices that can use alkaline batteries of the same size. Manufactured in Japan by FDK Twicell Co, Ltd, the sole manufacturer of NiMH LSD batteries in Japan. 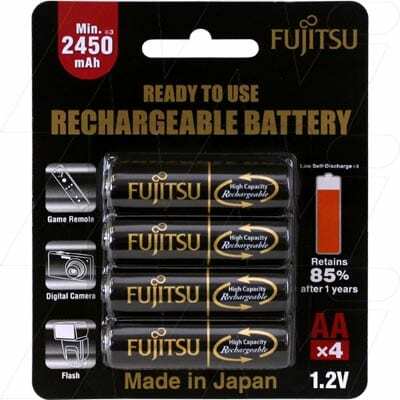 FDK LSD technology: high capacity NiMH batteries with superior charge retention makes Fujitsu LSD batteries ideal for virtually all situations where alkaline or lithium AA / AAA size batteries are currently used. Recharges up to 500 times! You’ll use hundreds of alkaline batteries just to match the overall life and performance of Fujitsu LSD batteries. Low self discharge means Fujitsu batteries are still ready for use even after long periods of storage – up to 85% charge remaining after 1 year of storage! Environmentally friendly – Fujitsu LSD batteries and packaging are completely recyclable.